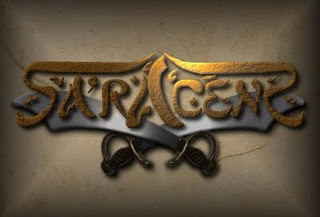 Indeed the composing on Saracens’ demo is one of the best possible when talking about Symphonic Gothic / Death Metal (similar to Epica’s aggressive songs). The vocals should probably have more ‘passion’ to them, but after all the musical composing is the main dish here and this Tunisian dish is surely tasty. The drums are also well played and varied, coping with the actual intensive rhythm guitar work, with those death riffs executed one after the other. Tell us a bit about the band’s history up ’till now. The beginning was just after the split-up of my ex-band Euthanasia in April 2008, a split-up due essentially to the instability of the line up and the lack of musicians who were really motivated to play the Gothic or Symphonic Metal Genre, all this made me decide to take all in hand and to work alone by creating a personal project, and that’s how Saracens was born as a One Man Band. After writing the songs and recording the instrumental parts I had recourse to two singers, Nour and Wafa, for the female vox and chorus part, who later became permanent members on the project, and with their arrival Saracens changed from the status of a One Man Project to a Band, later Melek the drummer and Iheb the violinist took their place with us. 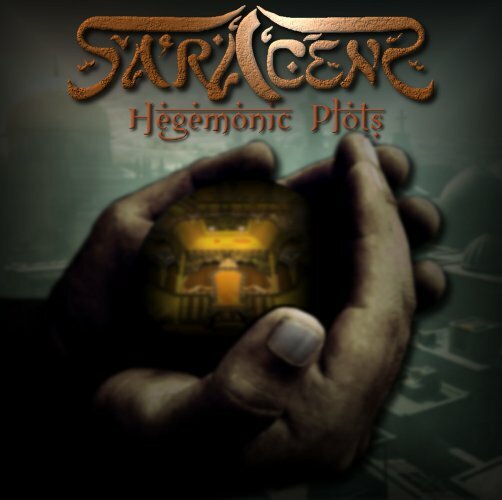 And in August 2009 our first demo “Hegemonic Plots” was released. Your demo contains 4 songs. How can you sum up the recording process? As I mentioned before, the recording of the instrumental part was realized when i was alone on the project. At first I contacted some studios but their prices were so expensive for me, so I decided to learn some recording lessons and started it by myself. For the vocal recording, the mastering and the mixing, it was really harder especially for a novice like me and it took many months to get the demo to sound good, not really what I aimed for but not really bad too for an auto-produced demo; you know, with the lack of means at our disposal we should make all by ourselves and we can’t hope for an excellent sound quality. Maybe in the full-length the quality will be more professional, I’m working on that and this first time was a good experience for me. What are the influences that you all share in the band? Our influences turn essentially around Gothic and Symphonic Metal, and of course some other horizons for each one of us. 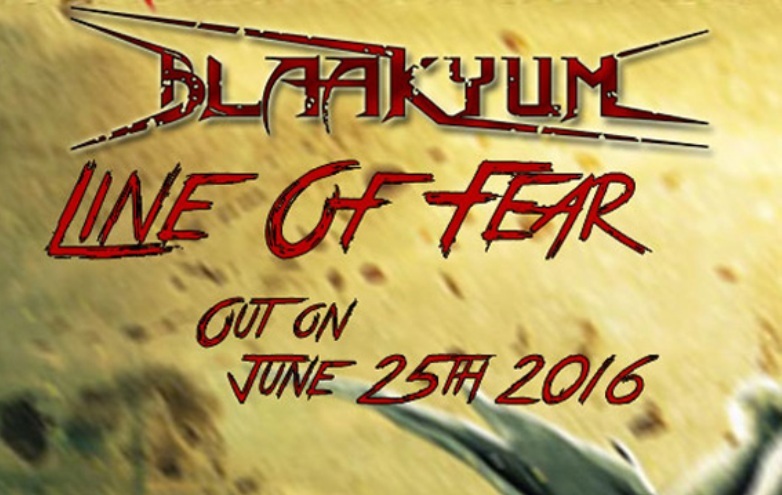 And to be honest, the writing of the songs was influenced by bands like Epica, After Forever, Therion, Tristania and Penumbra. Also there is a little influence of Death Metal bands arising from the fact that between the split-up of Euthanasia and the born of Saracens i had a little short experience with a local Death Metal band called The Old Crow, in this period I listened to a lot of Death Metal bands to be ‘in the mood’, and once I turned back to my Gothic and Symphonic Metal, i felt that some aggressiveness is missing on this music and a little Death Metal touch will make it more energetic and “alive” if we can say so, so I tried to put some Death Metal spirit into the male vocals, drums and a few guitar riffs hoping to emphasize that in the next songs. 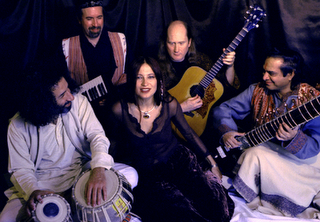 Concerning the Oriental touch, I was influenced by artists like Melechesh in the metal sphere and Stuart Chatwood, Maurice Jarr and others in non Metal genres. 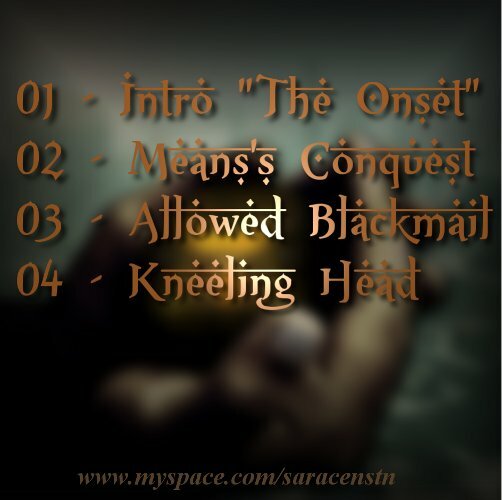 So to sum up all of this, the sound of Saracens is influenced by 4 styles of music: Gothic Metal, Symphonic Music, Death Metal and Oriental Music. 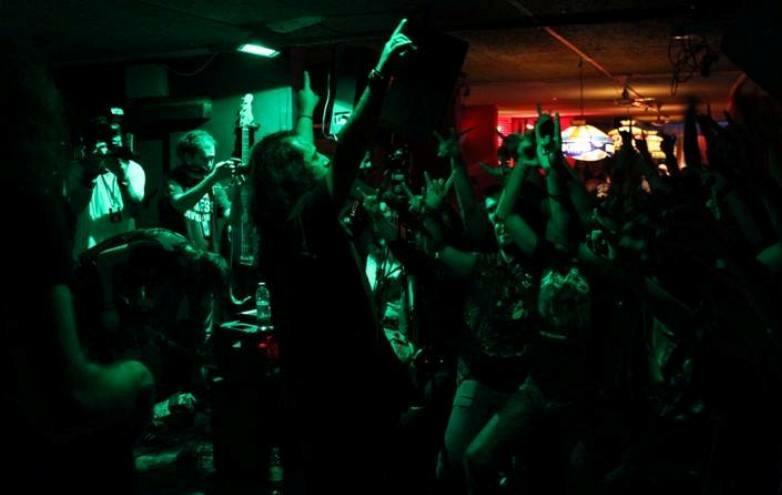 How’s the metal scene doing in Tunisia? Any other metal bands with demos or albums? 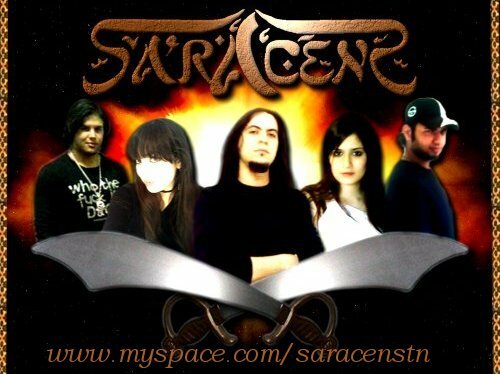 The Tunisian Metal scene, and just like all the nontraditional metal scenes, suffers from a lack of support, metal is still always seen by Media and people in decisive positions as a foreign music to our Arab World and a kind of music just for marginals. Musicians and fans who want to act must do it by themselves and fight against the tide, I’m speaking about finding a place for the rehearsals, producing music and the organization of concerts which are facing many problems, but we can’t deny that the situation here is better than many other Arab countries. What does the band’s lyrical themes revolve around? I must clarify that everything about the band, from music to lyrics and even the artwork and all the others stuffs, has the same and unique concept which is Arabic Nationalism, we try to defend our nation and why not to clarify some preconceived ideas about us, we all know that Metal which is an occidental music has more chances to be listened to by occidentals rather than any others, so why don’t we use this opportunity to get our voices heard by this occidental public far from the wrong ideas spread by Medias under the Zionist control. In this demo “Hegemonic Plots” I have evoked some plots against our Nation, for example Means’s Conquest speaks about the real aim of the Invasion of Iraq, Allowed Blackmail speaks about the Holocaust used by Zionists to swindle the occidental world to get their hand over Palestine and the last song Kneeling Head speaks about Americans who are obviously controlling the world but in reality they are just a mere puppet under the control of the Zionist Lobby. What’s the next step for Saracens? Work, work and work. We will try to make some gigs and maybe we will attend some auditions for some local festivals it will depend on our engagements. But the most important part will be the next release, a full-length album on which we will bet to land a contract with a Label, to be honest I’m not hoping for something really interesting with this demo, it was just a way to present the band, but for contacting Labels I prefer to bet on something more spellbind, it will be the upcoming Album, I’m really hoping that. Would by any change the band consider playing in our local Lebanese scene? What would you believe are the biggest challenges that overcome Arab metal bands? It will be a honor for us to play in Lebanon some day, but as we are in our beginnings we must do many gigs here before thinking about playing in others countries. And for the second part of the question, Arab Metal Bands are simply overthrowing the old dogmas and using a new space for the freedom of speech, Metal is a wise and noble mean to speak about what really is our problem, we continue doing this everyday even with all the hindering and difficulties and with every release that comes out we are overcoming a new challenge every time. Any last words for your fans and for the LebMetal.com readers? I don’t think that we can speak about fans yet, we are just in the beginning of our road. Anyway, I have to thank you for your support and your interest? ?in Saracens. And many thanks for everyone who gave a listen to our works and stay tuned for a full-length on the road.